This month’s mittens are inspired by one of my favorite designers, Orla Kiely. I have items with her designs all over my house from my computer bag to the guest room towels. I wanted to make a pair of mittens with a similar look. I knit these mittens up as a present for someone who specifically asked that they be vegan, so I used a yarn that was a cotton and acrylic blend. They are super soft like a favorite t-shirt. Still, I would like to knit up a pair for myself in wool, I think they would be even prettier. 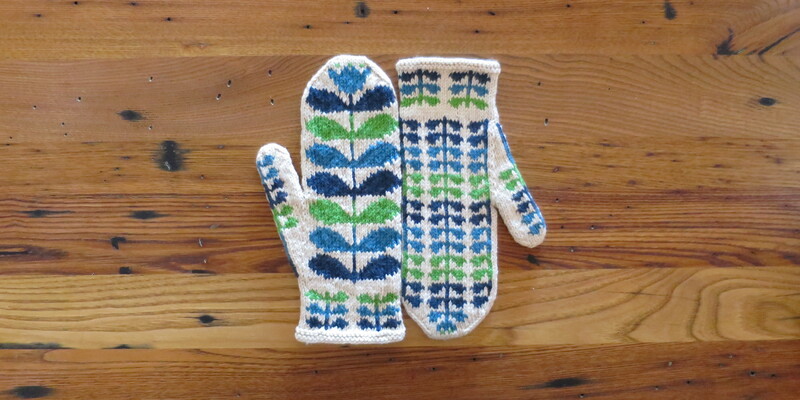 Oh my gosh, only one more pair of mittens left for the year! sport weight yarn in four colors – approximately 130 yards of the base color and 40 yards of the other three. I used Knit Picks Comfy Sport in Ivory, Planetarium, Marlin and Peapod. Follow the written pattern for shaping and the chart for color changes. Work chart as shown for left hand then do the side with the bigger leaves first for the right hand. Cast on 52 stitches. Divide between three needles. Join together to knit in the round being careful not to twist the stitches. Place a stitch marker between the last and first stitch to mark rows. Cut yarn leaving about a 12” tail. Seam top of mitten with Kitchener stitch. Put the 19 stitches on the yarn onto three needles. Pick up and knit a stitch from the hand of the mitten. Place a stitch marker after that stitch to mark rows. Cut the yarn leaving about a 10” tail. Seam the top of the thumb with Kitchener stitch. 4 years ago by Kat in Knitting , Knitting Projects , Needlecraft , Projects | You can follow any responses to this entry through the RSS feed. You can leave a response, or trackback from your own site. Great job on all the mittens this year. You are inspiring! Mittens are such a satisfying project because they are down quickly! I can’t tell you how much I have enjoyed this challenge of yours. 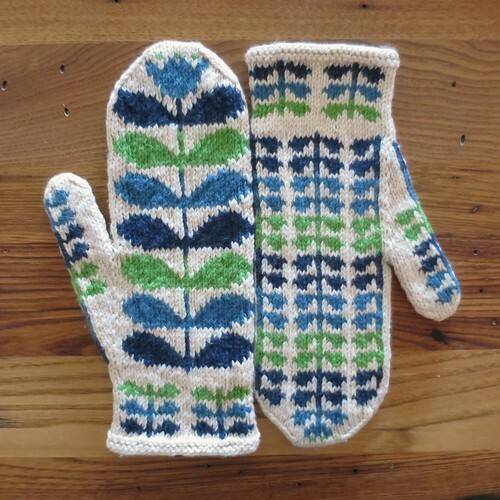 Another pair of fabulous mittens. The colors and design are spectacular. I can’t wait to see what December brings. Congrats. Oh, I’m so glad & you aren’t even a knitter! For me it is about creativity, inspiration and the creative process. I love when people share their design inspirations and how they think creatively. Besides–quality is quality regardless of the medium. Love this!! the colors are great. Found you on craft gawker. These are awesome. Nicely done once again. I knew you’d like these & they are your colors too. These are really special. Love al the mittens you’ve done! in any case, i’ll k17. and, thank you so much for this pattern. it’s lovely. i cast on yesterday and can’t wait to finish. they’re adorable already! Oh my gosh, you are so right. That is a silly typo. Thanks for catching it. lol a knitter with an english degree *can* come in handy! i’m SO loving this pattern. thank you, again! I go over and over those patterns, but something like that is so easy to miss. Glad you are enjoying them. I really need to knit myself a pair too. Any thoughts on trying this with the magic loop technique (rather than dpn’s)? LOVE the Orla Kiely pattern. I must now make these for all of my friends. I am having a problem with this if anyone can help me out. When casting on, should the first needle hav4 17 stitches, middle needle 18, and 3rd needle have 17 stitches? I’m having a problem when knitting the gusset? First time working with 3 needles.